Typically pasta dishes are on my “Do Not Make” list. I grew up in an Italian family so pasta is a true comfort food for me, but I don’t want to resort to it all the time. So if I can, I try to find something healthier to make. 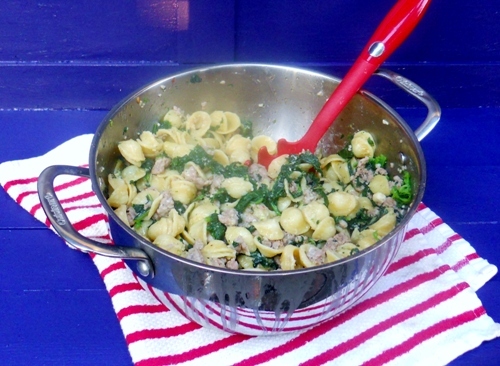 William Sonoma’s Orecchiette with Broccoli Rabe and Sausage recipe is an exception, though. It’s incredibly easy to make while still giving the impression of a well-prepared dinner. I was not accustomed to using broccoli rabe until I started making this recipe. The strong taste took a little getting used to. It’s like spinach, but stronger and tougher. This makes trimming and chopping after boiling important steps as well as adding the right amount of seasoning. You get used to it the more you make it. Be sure not to skip the step of cooking the pasta in the leftover water from the broccoli rabe. It really brings out the flavor. What’s your go to fast, but polished meal?